Teams of 4 SUP Paddlers have 2.5 hours to navigate through the mangrove mazes of Ten Thousand Islands to retrieve treasure from 15 hidden treasure chests. The team to collect all 15 gold doubloons and cross the finish line in the shortest amount of time wins. Water Shuttle Schedule – Reserve a space on the shuttle during sign ups. Shuttles leave on a rotation from Goodland boat park for the island approximately every 30min. If you have signed up for a shuttle ride, you will be assisted with which shuttle to take once onsite. Please plan on arriving on time as space is limited and we are on a tight timeline. IMPORTANT: THE LAST SHUTTLE WILL DEPART FROM GOODLAND BOAT PARK AT 5:30 PM EACH DAY, AND WILL DEPART THE ISLAND AT 6PM EACH NIGHT. YOU MUST ARRIVE BEFORE 530 IF YOU ARE PLANNING ON GOING OUT TO THE ISLAND ON FRIDAY EVENING. IF YOU ARE NOT PLANNING ON CAMPING ON THE ISLAND YOU MUST BE ON THE LAST SHUTTLE OFF THE ISLAND AT 6PM. Morning Paddle clinic and breakfast presented by NSP/Surf Tech. Come learn the to navigate the local water ways and tides with the NSP/Surf Tech team and local paddle expert who will give you some inside information on how to paddle the tunnels of Cape Romano. The "Sun Bum Lounge" will be open after the race with fruit, snacks and drinks for all participants. There will be a bon fire, and beach games followed by a beach side film premier of #BananaSuitFridays. Join the 4ocean Community Cleanup Team Sunday morning for a clean up of the Ten Thousand Islands area. 4ocean will provide hemp bags and gloves for all of the volunteers to use during the cleanup. Make sure to check out our Education Village and a 4ocean Pop-Up Shop during the cleanup event. This is your chance to purchase 4ocean hats, 4ocean reusable water bottles, 4ocean shirts and any of the 2019 limited edition bracelets! ● Participants will start on Cape Romano, Ten Thousand Islands, FL. ● At the sound of the cannon teams take off into the course in any direction they choose. ● Teams will have two and a half hours to collect one doubloon from each of the 15 treasure chests. ● The team that collects all the doubloons and crosses the finish line in the fastest time, wins! ● All team members must be present at the beach with their medallions before they may cross the finish line. ● All teams will consist of 4 team members. Participants will be assigned to a team if they enter as an individual. ● Participants may have more than one person per board if they choose, but may not go over the 4 person per team restriction. ● Teams can stay together of split up, depending on strategy. ● SUP and Prone will be allowed to participate. No canoes, kayaks, or boards with additional propulsion of any kind. NOTE: While we understand that this is a fun event, in the effort of safety Red Bull will enforce a strict no alcohol rule on Saturday morning through the duration of the race. Red Bull reserves the right to disqualify any participant from the race that has violated this rule or our staff deems unfit to compete. ● The official launch point is Goodland Boat Park. Boat shuttles to the island will be available to those who register for transportation upon sign up. This will be an additional $25 fee for those who choose to take the shuttle. ● For those not taking the shuttle, transportation out to the island will be up to you. Paddling out to the island is possible from Caxambus Park on Marco Island. ● Team check In, will be at the Goodland Boat Park on Friday and Saturday morning. ALL participants must check in prior to getting out to the island. ● Parking is available on Goodland Island. Unload your gear at Goodland Boat park and follow the signs to 1 of 2 parking lots a short walk away from the launch point to park your car (1/4 of a mile). ● Overnight parking in a secure lot is available to those who register to camp on the island. Red Bull is not responsible for lost or stolen items. IMPORTANT: THE LAST SHUTTLE WILL DEPART FROM GOODLAND BOAT PARK AT 5:30 PM EACH DAY, AND WILL DEPART THE ISLAND AT 6PM EACH NIGHT. YOU MUST ARRIVE BEFORE 530PM IF YOU ARE PLANNING ON GOING OUT TO THE ISLAND ON FRIDAY EVENING. IF YOU ARE NOT PLANNING ON CAMPING ON THE ISLAND YOU MUST BE ON THE LAST SHUTTLE OFF THE ISLAND AT 6PM. ● Participants who register for a spot on the transportation boats will have a spot for themselves, board, and gear out and back from the Island of Cape Romano. ● Shuttles will be departing from Goodland Boat Park every 30min for those that register for a shuttle spot upon sign ups. Participants can bring camping gear and boards along with them, however SPACE IS LIMITED. ● Additional transportation options are available in the Ten Thousand Islands area. Participants are free to rent or bring their own boat to get out to the island. Paddling out to the island is also a possibility from Caxambus Park in Marco Island for day trippers. No overnight parking is permitted at Caxambus. ● SHUTTLES STOP RUNNING AT SUNSET, so please make sure you plan accourdingly if you with to take a shuttle. Participants who want to stay on island will get to be a part of the event atmosphere with music, bonfires, manufacturer equipment, board demos, and events provided at partner campsites. ● If you plan on camping Friday or Saturday night, you must specify with us upon registering for the event. ● Additional waivers will need to be signed for those that camp. ● Campers who register for transportation will have access to the transportation shuttle beginning Friday at 1pm. ● If you plan on camping please follow all the rules of the Rookery Bay National Estuary, do not damage the environment and please clean up after yourself. ● Food Boats will be onsite Friday night and all day Saturday to provide food and drink options for participants so be sure to bring some cash/card. Participants not wanting to camp can stay at 1 of 2 hotel blocks we have set up just outside of Naples, a modest drive from the Goodland launch point. All participants are required to book their rooms on their own, and rooms are limited. Click the link below to book your room under the Red Bull Privateers group rate. How do I get to the starting line? This is an adventure race, and getting to the starting line is an adventure all in its own! All participants need to find their own way out to the starting line. Paddle out, rent a boat, bring your own, however you want to get out there, but the cannon fires at 11am on Saturday, February 10th! Where can I launch my board? The main launch location is Caxambus Park & Boat Ramp which is about 1/2 of a mile paddle away from the Northern tip of Cape Romano, and 2.5 miles from the start line and event base camp. If you are staying at one of the hotels on the beach, you can paddle directly from your hotel out to the start line. There is also public beach access next to the Hilton parking if you want to paddle directly from there. Can I rent a board or do I need to bring my own? This event is BYOB or Bring Your Own Board. We will be working with local shops to have a limited amount of rental boards onsite, but these will be 1st come first serve. There are many Marco Island/Naples board rental companies in the area to rent and reserve a board in advance. Can I get help bringing my board and supplies out to the island? There will be a shuttle Friday afternoon and all day Saturday running between Cape Romano and Caxambus Park to help bring boards, camping supplies, and people out to Cape Romano. The shuttle will have limited space and be on a tight sechedule. Please be advised that space will very limited on these shuttles. Based on schedule and space, do not plan on this being your primary transport out to the island. There will be 24-hour security on the island to watch boards and supplies. Can we have more than 1 person per board? Yes! If you and your Crew are that close that even the fiercest creatures of Davie Jones couldn’t pull you apart, than stick together and win together! If you wish to participate and don’t have a partner, there is an individual registration option. Red Bull will assist these participants with getting a team together once onsite. Are we limited to board size? There are no board size limits. Are boards other than SUP able to compete? All Stand Up Paddle boards will be allowed to participate in the event. Prone boards can participate as well. No Canoes, Kayaks, or boards with additional propulsion of any kind will be allowed. PFD or Personal Flotation Device and leash are required on your person/board at all times in accordance with Florida State Law. Additional safety equipment such as booties are recommended as there are many shells on the beaches and oyster beds in the mangrove areas. Will there be food provided for the event? At the Red Bull Base camp on Cape Romano, there will be local “food boats” that will have breakfast, lunch and drinks available to purchase for everyone onsite. A dinner Luau and Pig Roast will be provided for all registered participants with a Red bull wrist band after the race ends. The food boats will remain on the island all day on Saturday if you wish to purchase a meal outside of this, but packing a few snacks of your own is recommended. These boats will also have several beverage options for purchase as well. Will there be water for the event? Red Bull will provide water for all participants in the event during the race. However, if participants are camping on the island before or after the event, it is recommended to bring enough water and supplies for you and your team while on island. Will Red Bull provide the necessary safety equipment? Sunscreen, Bug spay and water will be provided to all participants onsite. Additionally, there will be medically trained FWC and safety officers stationed on the islands and throughout the event course in the event medical attention is required. A detailed safety plan will be sent out and discussed with all teams prior to the race, as well as onsite before the start of the race. There are several hotels available on Marco Island and in Naples. Hotels on the beach on Marco Island can get quite pricy and fill up fast so we suggest rooming with your crew as much as possible. There is no hotel partner for this event, so particpants and spectators will need to find and secure hotels on thier own accord. YES! What better way to truly enjoy the full beauty of the Florida Everglades than to camp on a remote island on the Western edge of it! Participants are encouraged to arrive Friday night. Red Bull will be setting up a base camp on Blind Pass beach on Camp Romano along with our other event sponsors on Friday night. How can I secure my Camping Spot? Campsites are first come first serve and are CAMP AT YOR OWN RISK. Blind Pass Beach on Cape Romano is the suggested campsite and is a 2.5 mile paddle from Caxambus. This is where will set up our event base camp, as well as where we will be holding all of the event activities. Please remember that this is “Primitive Camping,” meaning no toilets, water, etc. so plan on packing everything you need for the weekend (food, water, sunscreen, etc). There is no permitting or reservation system, and these sites are only available on a first-come, first-served basis. All on island camping information can be found here. Boat rental options are available on Marco Island and in Goodland FL through several charter companies and boat rental companies. Carpooling with your team is highly recomended as parking on Marco Island is very limited. Caxambus Park (where you will launch from) is a public park with free parking (You must pay to launch a boat and park a trailer). There are many vehicle spaces at the park as well as a large overflow grass lot for about 100 cars. The lot closes at 6pm and there is no overnight parking. Parking here will be at your own risk and Red Bull will not be responsible for any lost/stolen/damaged property or tickets. Please park responsibly and do not impair the locals using the ramp. Red Bull has also secured a free private parking lot at the Hilton Hotel about .75 miles away from Caxambus park. This is a secure lot with gate guard on duty. There will be a shuttle running all day Saturday to and from the Hilton and Caxambus park for people that choose to park here. If you choose to park here, drop off all of your boards and gear at Caxambus park first and then go park your car to save room in the shuttle. This is the only location for overnight parking if you intend to arrive/camp on Friday. Please note that the Hilton Hotel is closed for renovations, so please DO NOT walk through the hotel. You may also paddle directly from the public beach access next to the Hilton Hotel to Cape Romano if you choose. The course is a .503 mile/.811 kilometer, 9-turn city circuit around Alamo Plaza in San Antonio, TX. It uses a unique eliminator format with the last rider eliminated on each lap until only one rider remains. Where is Red Bull Last Stand taking place? During the event the Alamo will remain open through out the normal operating hours. Please visit http://www.thealamo.org/ for more information. While Red Bull Last Stand will not be televised you can find out more information about event coverage by visiting the Facebook page for the most up to date information on how to follow the race. Will local businesses be open around Alamo Plaza? All local businesses will be open for normal business hours during the event. Please stop in and support the neighbors who have welcomed us into their home. YES!! We’d love to see you there! General admission is FREE OF CHARGE. An upgraded hospitality experience is being hosted by the San Antonio Current. Details for details please see the VIP access information page. Complimentary bike valet will be provided. During the event the Alamo will remain open through out the normal operating hours. Please visit http://www.thealamo.org/ for more information. How do I get to Alamo Plaza? 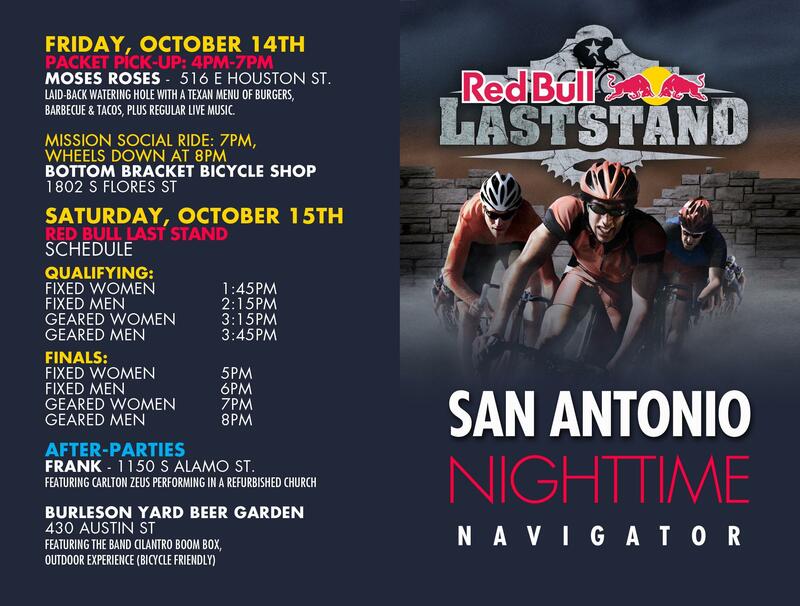 Red Bull Last Stand will take place on Alamo Plaza in downtown San Antonio. Public parking can be found in all the adjacent pay lots and parking meters through out downtown. If you would like to ride your bike you are in luck! Complimentary bike valet will be provided. What time is the competition? Yes! There will be Red Bull and water for sale in all spectator areas inside of Alamo Plaza. There will also be food available at the Corner Store Food Truck on site as well as an Energy Garden featuring beverages, beer, and wine selections. An upgraded hospitality experience is being hosted by the San Antonio Current. Details are available on the VIP access information page. Yes temporary public restrooms will be available on site. We are staying for the weekend. What else is there to do? What isn’t there to do? San Antonio is a wonderful city full of deeply rich culture combined with the vibrant pulse of a world class modern metropolis. Be sure to log on to www.visitsantantonio.com for tips on what to see and where to go while visiting. Are media welcome to attend? Absolutely! For media inquiries please contact Molly Uhlig, Red Bull Media House Communications: molly.uhlig@us.redbull.com for information and credentials. How do I follow the conversation online? For real time updates and information, visit our Facebook Event page. Share with us on Facebook, Instagram and Twitter and use #RedBullLastStand and be sure to look for all your tagged posts and photos! 1.01 Track bikes are required for fixed gear races. 1.02 Drop bars, with bar tape, plugged ends and without brake levers are required for fixed gear races. 1.03 A lock-ring securing the cog is required for fixed gear races. 1.04 All components of the bike must be in good mechanical condition. 1.05 Excessively large gear ratios are prohibited (determined on a case-by-case basis at the race directors discretion) for fixed gear races. 1.06 Lights and reflectors are prohibited. 1.07 Time trial wheels are prohibited (Aerospokes, disc wheel, Spinergy, tri-spokes, rims deeper than 90mm, etc) for fixed gear races. 1.08 Roadbike fixed-gear conversions are prohibited for fixed gear races. 1.09 Timing chips must be installed per instructions provided at check-in and must be returned to Course Exit or Athlete Check-in post race. Please be prepared to leave a deposit, credit card or ID as collateral for transponder. Any unreturned transponders will result in a $100 charge. 1.10 Tubular tires must be installed properly with glue in good condition. Tires must not be glued on race day. 1.11 Rear axle must sit entirely within the dropout for fixed gear races. 1.12 Clipless pedals and shoes are required (pedal/toe straps are prohibited). 1.13 Helmets that meet the US DOT, CPSC standard, or European CEN Certification are required. 1.14 Jerseys with sleeves are required. 1.16 Helmet or chest mounted cameras are prohibited unless provided by the event for broadcast purposes. Handlebar and bike mounted cameras must be disclosed and approved at rider staging. 1.17 Race numbers are mandatory for scorekeeping purposes. Numbers need to be placed on riders right. 1.18 Bib numbers must be pinned on right side of jersey. 1.19 All riders must have a USAC or UCI license. One-day licenses will be available for sale from USAC. 1.20 All decisions from made from USAC officials and the race director are final and will follow guidelines established in the USA Cycling rulebook. 2.01 Athletes must conduct themselves in a manner that is not offensive in any way to fellow participants, spectators, officials or volunteers. 2.02 Athletes must treat all participants, officials, volunteers and spectators with fairness, respect and courtesy. 2.03 Riding the course during set-up is prohibited and can result in a penalty or disqualification. 2.04 If an athlete’s conduct is deemed offensive, a disciplinary action may result in a starting grid penalty, overall series points deduction, expulsion from the race. 4.12 The use of phones is prohibited at all times on the course during qualifying and racing. 5.01 All qualified athletes must enter the course through the rider staging area. Entering the course in any other location is grounds for disqualification. 5.02 After all athletes are on the course there are (2) neutral laps behind a pace vehicle. Athletes are not allowed to pass the pace vehicle. 5.03 After the (2) neutral practice sighting laps rider will see 5 laps to go and may begin qualifying. 5.04 The starting grid will be called up in grid order starting with bib 1 and followed in sequential order will start in their position on the track as determined by the race director and course whip. 5.11 There is a 1:00 minute and a 30 second warning before the race start. Once the :30 second warning is given the race may be started at any time by the race director. 6.01 The race is distance (50) laps for the men and (30) laps for the women. The race director reserves the right to adjust based on racing conditions, mishaps, and other outside circumstances. 6.02 A lapboard is used to count down each lap. 6.03 The length of the race is subject to change at any time per the race director’s discretion. 6.04 A bell is used to signify the start of the last lap. 6.05 There are NO free laps for mechanicals or crashes. 6.06 Any riders lapping the field will be scored on the same lap of the field, so there is no benefit for lapping the field. 7.01 Primes will be awarded randomly during the race. The first rider across the line will be awarded the prime. 7.02 The Battle Ride Laps led award will be determined by the athlete who leads the most laps during the race and crossing the finish line in the first position the most number of times. In the event of a tie the rider who crossed the finish line most recently will be the winner of the laps led award. 7.03 A bell will signify the start of the prime lap. 8.01 If the race must be stopped for any reason, the race director and course marshals will indicate the race stoppage by waving the red flags around the circuit. 8.02 Athletes must line-up before the start/finish line at the spot designated by the Race Director. 8.05 No outside interference from team managers, friends, or sponsors. 8.06 Athletes may not replace any equipment during a red flag. *athletes should self-organize into which group they were in. Call-ups will then be conducted to separate the groups. **athletes who need prolonged medical attention will not be allowed to restart. The race director will follow advice from the medical staff. 9.01 If an athlete finishes in the top (3), wins a prime, and leads the most laps, and is the winner of the double down award they must report directly to the podium area immediately after the men’s geared race. 9.02 The podium ceremony starts immediately after the finish of the men’s geared race. 9.03 Any athlete arriving late or skipping the podium presentation forfeits all prizes. 9.04 Athletes must pick up the prizes immediately after the podium ceremony. 9.05 Race kit is mandatory for the podium. 9.06 Athletes are prohibited from bringing their personal bicycle onto the podium. 10.01 The race is fast and the corners are tight. Athletes must give each other room to slow down for the approaching corners. 10.02 It is important for athletes to hold a predictable line through the corners and give their competitors room. 10.03 Skidding into corners is not advisable. Athletes must keep their rear wheels rolling as much as possible. Athletes skidding dangerously into corners will be removed from the race. 10.04 Athletes must hold their line at all times. 10.05 Athletes must exercise caution when passing eliminated competitors who have not exited the course. Eliminated athletes tend to be unpredictable and may not ride a straight line. 10.06 The course is completely closed to traffic. 11.01 There is an EMS team in position to respond to any injuries sustained during qualifying and the race. 11.02 Ambulance is on duty if transport to a hospital if needed. 14.03 Athletes must ride within their ability. Getting eliminated is better than ending up in the hospital. 12.01 Athletes are not allowed to have any current or past doping charges against them. 12.02 Athletes agree they will not commit a doping violation as defined by the USA Cycling, USADA, and World Anti-Doping Agency (WADA). They will be subject to random testing as defined by USADA. 12.03 Athletes declare that they are not currently serving a doping violation and/or do not have a pending or unresolved doping charge. 12.04 Athletes confirm they have never in their athletic career taken “banned substances” without a Therapeutic Use Exemption (TUE). 12.05 Athletes confirm they have never served a doping violation. 12.06 Athletes verify that any drugs they are taking or might consider taking are not on the “banned list” and further verify that they do not consume any substances or products which contain “banned substances” — this includes over the counter medications and prescription drugs. Think your crew can Mini Moto?